With more and more cloud backup services shutting down or becoming compromised these days, making your own cloud backup server on a ServerMania Hybrid, Cloud, or Dedicated Server is a great option. It sounds complicated, but making your own personal cloud backup server is actually really easy to do. This article will outline how to install OwnCloud on your CentOS 7 Server, which allows you to easily sync files across all of your devices. What is a personal cloud backup server? You may be wondering why you would want to make your own cloud backup server. A cloud backup server is like Dropbox or Google Drive. It’s a server located off of your device which you use to store files. You can easily upload files to your cloud server from your android, iOS, or desktop device and it will be synced across all devices that use the OwnCloud app. Isn’t setting up a cloud server difficult? Making your very own cloud backup server is actually pretty easy to do. We’ll detail the steps now. Why would I want to build my own cloud backup service? There have been a number of cloud storage services lately that have shut down or had to drastically raise their prices. Running your own cloud backups on your own server means that you can control everything on the server and you know the service won’t be shut down. Building a storage server of your own often provides you with a greater amount of storage at a cheaper price. The server requirements for setting up your own cloud backup server are quite modest. It can run on any ServerMania Hybrid, Cloud, or Dedicated Server depending on your disk space requirements. On this page, you can set your admin username and password which you will use to connect. Your personal cloud backup server is now setup. 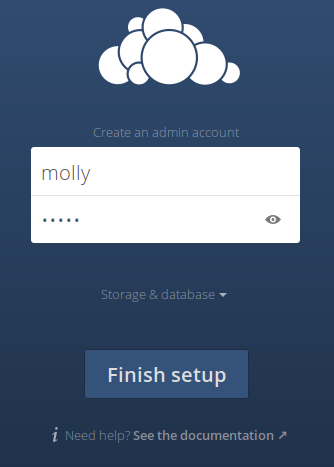 You can now download an OwnCloud desktop or mobile client for your device and begin syncing files across all of your devices!